Targeted Individual (TI)’s targeted with microwave torture live a difficult life. As the UC San Diego study on Microwave exposure by US diplomats in Cuba showed, subjects face major symptoms — especially pain and fatigue. Ordinary citizens subject to the same weapons suffer the same. It’s not coincidental that the early DARPA tests of weaponizing microwave frequency were meant to “neutralize” subjects; used on monkeys, they found 1 of the 2 monkey hit with microwaves completely stopped activity. One of their key purposes is, in fact, “neutralization” and they can accomplish this if they get direct, unimpeded access to you. I’ve written extensively about wearable shielding for TI’s here, and am very proud to have discovered and popularize the notion that rubber and rubber-based metallic shielding is the best wearable option for TI’s to block DEW — as it shields but does not conduct. I’ve expanded this research to cover wearable options that cover virtually every part of the body. I believe this research will go a LONG way to helping TI’s drastically reduce the effect perps have in wearing down our bodies. We know now what armor to wear against such futuristic weapons. “So Jay, why can’t I just take your wearable shielding advice and leave it at that?”. My simple answer is: because it’s heavy. When I get ready to sleep- I wear it all because I wont move when I sleep; there’s no real weight to bear. But when I’m up, it’s natural to keep shielding to a minimum. If I am constantly moving my arms such as to type or finding a document in my desk drawer, I don’t want heavy shoulder sleeves and forearm shielding weighing me down. The leg shielding (Xenolite skirt) is also cumbersome. Finally, you can’t always shield everywhere — you cover everything but your hands and toes- and then that’s where you get zapped. 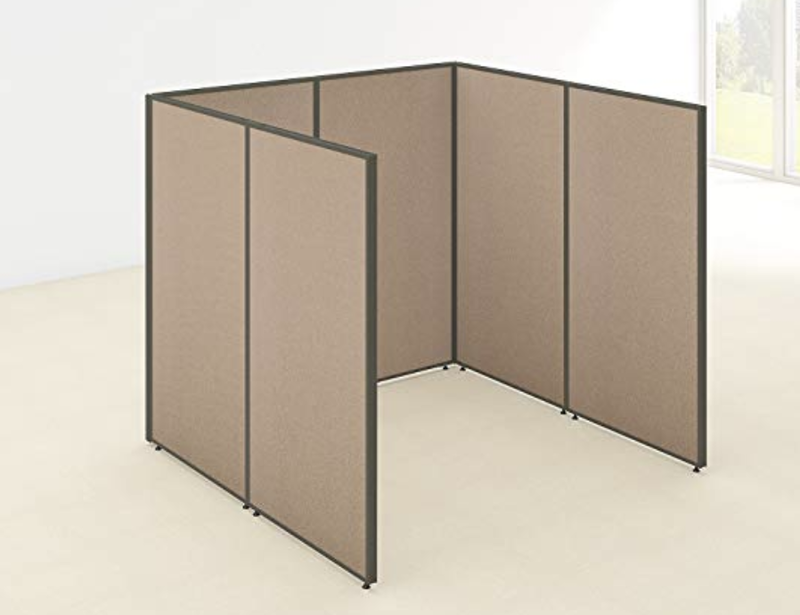 Shielded Areas theoretically can provide 100% coverage and you may not need wearable shielding within. If you design them well, during the day, you may not even have to wear much of your wearable shielding- well at least while you’re inside it. I found immediate relief from this sound torture. The lead is 1/8" — thick stuff! I would also drape dental lead vests on top of what you see to get full coverage. The loud high pitched siren sound (delivered via microwave frequency and heard through the Frey Effect). The tent did not completely eliminate the sound, but it blunted it to the point that with some sleep headphones playing white noise I could sleep fine. With this structure, they were NEVER able to keep me up all night; nor wake me up mid-sleep at will. But as you can imagine I cannot spend whole days under that head tent which is just big enough for my head to slide under :) . So I got to thinking- what if I make a really LARGE version of this head tent using the same core shielding materials- but mainly the 1/8th inch lead material on all sides. 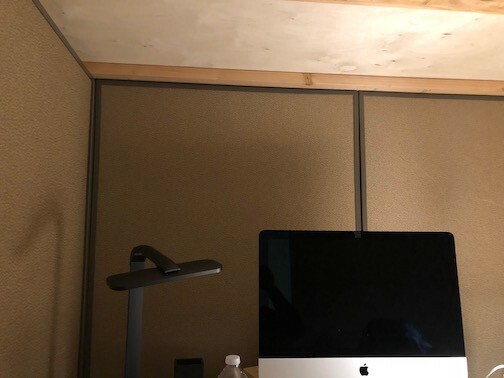 I decided to build the lead hut in my home office, around my desk. The lead was expensive; I ordered 1/8" sheet lead, typically 1 foot by 4 feet (and 1'x2'). This was a LOT of lead. It cost me several thousands of dollars and cumulatively weighs 1,200 lbs to cover 5 sides (all sides but the bottom). To begin, I purchased what I believed would be a robust structure. I bought Bush Business Furniture ProPanels. .For that I went to a wood specialty store near where I live called MacBeath. As I’m writing this Medium article, I’m referencing my notes under my Project ToDo doc (this project is listed as “Shielded WorkCube”) to recall the precise details. When I undertook this project, there was no blueprint, so I went through a few iterations of how I should do this. My first thought was using cantilevers to hold the lead next to the cubicle walls— cantilvers are designed to hold significant amounts of weight. But there was no room in my office to accomodate them as they can be quite wide. So after hiring a contractor who would ultimately build this, we agreed upon shoring up the cube walls with 3/4" Baltic Birch plywood (which is fairly strong). The plywood sits on the outside of the cubicle walls- roughly having the same measurements- supporting all the weight from the lead. 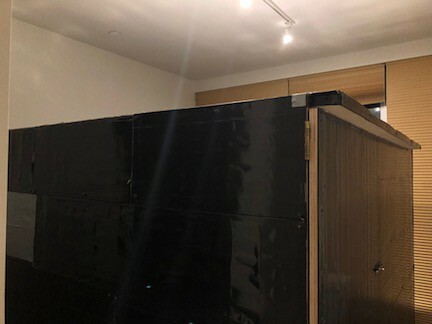 The plywood was cut to size to parallel each wall (the contractor brought a table saw that was used to get the right dimensions), to cover the top of the cubicle; and then 2x4s were used in addition on the top to support the lead on top of the cube/wood structure. (just like 2x4’s are often used to support a house’s ceiling). I knew 1/8" sheet lead worked in blocking the microwave-projected acoustics from my head tent. You can buy it on places like Amazon; or local dealers like RotoMetals. I typically bought it in 1' by 4' dimensions. I did the measurements for the wood sheets that lined my cube and ordered enough lead to cover all the sides and top. They were received as rolls. So step one was hammering them flat. Lead is soft. It can be cut easily. We cut the lead to match the dimensions of the wood structure we just built. We then taped the lead sheets with Gorilla Tape to ensure there was no lead exposure as lead particles can cause health problems. The lead was then nailed directly into the sheets of wood. There were some other details. Leave a small cutout at bottom for running electrical wires and cables in and out of the lead hut. The back wall has a door built into it so I can get in and out. I just put 2/3 of the wall with the plywood. The remainder put a 1/3 of the plywood on hinges so it swings open like a door. It has bolts to keep it in place. Ventilation: Right now I’ve left about 1.5 feet below the door open. This is not ideal from the standpoint of shielding, but my body is still mostly protected from direct DEW hits and the sound is blunted. 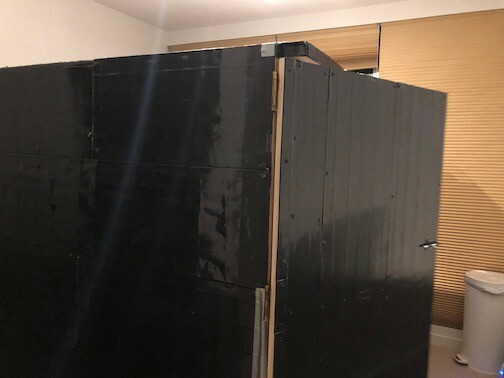 The Lead Hut as it looks walking into my home office…..
It’s basically a cube that’s 6 feet by 6 feet by 5.5 feet tall. This is the view of it when you walk into my home office room. 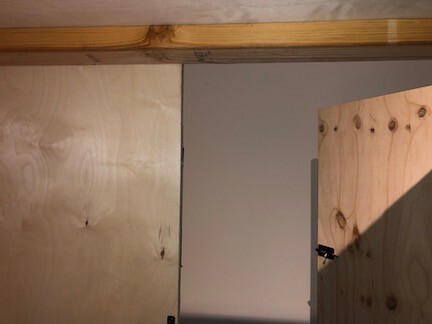 You can get a sense of the thickness of the plywood in seeing the wood part showing of the door. I taped the lead with black Gorilla Tape (except one portion on the left at the back where I ran out of black — lol). The Lead Hut with the door swinging open….. The door is lead shielded as well. It has bolts on both sides. I really didn’t want to put the bolt on the outside too because it looks creepy; but the way the door hinge is constructed, if the door stays open too long, it sags and then the door doesn’t align with the bolt to keep it closed from the inside. This is where I’m typing this now (very meta!). You can see on the inside it looks like a normal office cubicle for the most part. You can see the wood roof. The end on both sides you see the 2x4 that give more support for the roof, as it has heavy lead on it. The lead hut has been sturdy and no issues about stability after two months of using it. Inside the Hut looking out…..
Just another view. You can see the wood construction. Door is open. The other side of the Lead Hut….. Nothing too much to see here but just gives you a sense of the lead hut relative to the office. 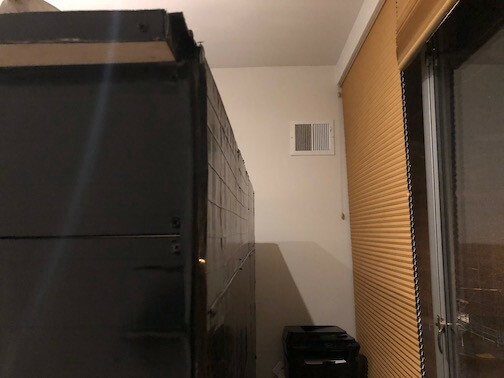 It takes up most of the space in the room. So How does the Lead Hut work for my TI Targeting? There were a few things, as a TI, I was concerned about when I first built this lead shielding hut. Starting late December I was hit with very loud microwave noise- the same kind that afflicted US diplomats in Cuba. I’ve been a TI since 1999, and from then to now, I’ve always had this kind of targeting throughout. It’s usually a high-pitched siren noise in my case, or a kind of car alarm noise. What differentiated this case starting December 2017 is just how loud it was. And unlike the past, I could not get relief by movement, even by driving. It was persistent and related to an action I took that perhaps triggered the deep state apparatus (I know because it happened Immediately after this)- but I’d rather not go into this. I could tolerate this noise in the past often used as a warning for a period of time and then would disappear. This was BLARING and wouldn’t quit for days. I built my head tent to sleep at night but daytime I was exposed. The lead hut took some time to build. I had to get all the materials. Then I had five contractors refuse the job or quit in the middle. I finally finished 2.5 months later. I had acoustic for basically one week after it was built and then it subsided. But it worked JUST like the lead head tent did- it dulled the sound considerably; I could then listen to music or white noise and concentrate and get work done. Perhaps the perps realized that the acoustic would not bother me now I had the shielding for it and moved onto something else. But I do have data points for that week that it dulled the acoustic. My note from August 8, 2018: “Initial reaction to HUT is that it helps; especially head and upper body. Hear some acoustic, but less than outside it.” If they hit me again with acoustic- I’ll have my solution ready. Summary: Eliminates direct DEW hits, reduces overall “subtle DEW” wearing away of body. Much of my notes from January to May 2018 relate to being hit by DEW. I would use a lead apron to block parts of my body; but they would then target what wasn’t covered. I would get hit in my chest, heart area, lower back, abdomen, in my legs, forearms. In the Hut, there are really no direct hits. I am surrounded by 1/8" lead. There are rare cases, like every few days, I am hit in my feet (because of the aforementioned gap in the hut to allow ventilation) but it’s minor. I must say unfortunately I cannot measure the improvement in terms of RF exposure; my Trified meter shows similar RF numbers in and out of the Hut. But what seems clear is that even RF may riccochet around; there are no direct hits and that seems to make a difference. Reduces knockout attacks: with significant pressure on head, eyes become blurry. The lead seems to provide decent protection from this. It does not provide complete protection from EMF; until at least I fix the ventilation issue which is an opening into the shielded area. It does not completely eliminate microwave noise. It does reduce it quite a bit. The total cost I will estimate at ~$7,000. The lead cost was the largest cost, followed by the birch wood; the cubicle walls cost ~1K, and then I had to pay the contractor as well. People are sometimes concerned with lead; but if covered, the exposure is eliminated. To improve ventilation, I keep a fan inside and one outside to blow air in. It does stay a bit warm in the cube, so I keep AC up more in the office room and that keeps it fine. The outlets and power strips are outside of the cube. I reduce the number of electronics needed inside as any EMF produced inside the cube can ricochet around. I removed Wifi and run an ethernet cable to my computer. I reduce electronics because even when a device is off, if plugged in, it creates an electric field. Overall verdict: The lead hut seems to significantly reduce my exposure to DEW, and blunts microwave noise attacks when I get them. I hope to cover the open area which EMF mesh from Holland Shielding- which is breathable but the holes in the mesh are so small they do not permit frequency to enter. Holland Shielding Systems BV is a heavyweight in the shielding area. They have operated from 1985, they make shielding gasket solutions for devices to EMI coatings and lubricants. Their products are high-quality, industrial-strength (they market some of their products to embassies knowing the EMF risk they face) but also expensive. They are based in the Netherlands as you may have gathered from their name. Of interest to me was Holland’s Faraday Tent. I want to thank my friend Carolina (who’s also a TI) for making me aware of this product. Let me outline some problems I had, especially with sleep as a TI. 1- Sleep Interference — Most TI’s will complain of sleep problems. Sometimes we feel we just “can’t sleep”. My problem usually begins an hour before when I’d usually sleep: there seemed some artificial interference which would elevate my energy. We know from TI experiences, they can elevate our heart rate. They can also alter emotional states such as to “energetic”. This would start happening an hour or so before I’d sleep. 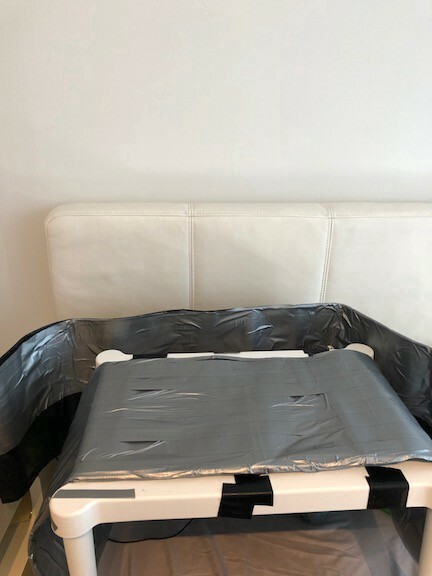 I believe this may be related to head manipulation because this energetic effect reduced when I put my head under my head tent (my head tent is a a table covered w/lead; when sleeping I put my head under this small table). However, as you can imagine, I don’t want to spend the hour before I’m ready to sleep with my head under a head tent! There’s nothing to do and it’s uncomfortable. The sleep interference continues while you sleep. In addition to energetic manipulation, they can also cause physical discomfort with DEW, with small zaps, that make it hard to relax. Bad sleep is almost as frustrating as no sleep. Sleep is a regenerative phase for both body and mind. We TI’s can be kept in a fragile, ever-declining state if we cannot access this regenerative period properly. One of my biggest complaints is the deterioration of my body over the last four years. I went from lifting weights 3–4x a week, playing tennis, surfing, and a lot more to barely being able to walk 2 blocks. I found that my muscles would always stay tense- which was bizarre- like they were always flexing. This would cause muscle fatigue where they could do very little. If I walked two blocks, my calves were extremely tight and I’d have to sit for 15 minutes or so. I discovered this was “subtle DEW”. The tent seems to reduce frequencies significantly; the reading for the Narda meter measuring 0–50 GHz in the tent is 10x less than outside of it. So it clearly is repelling frequencies, even those in the higher range. Nonetheless I still find myself having to wear wearable shielding at night.